Private equity has benefited from a uniquely privileged status since the 1980s when it first emerged as a major force shaping the US economy. Yes, there have been a few times that scandal and unwanted media attention have shined a light on the industry, exposing the immoral and potentially criminal behavior of some firms. But for the most part the PE industry has been allowed to conduct their buyouts of corporate America against little resistance from regulators, lawmakers, and shareholders. This hasn’t really changed since the meltdown of 2008 and the rise of Occupy. Populist anger at financial elites has mostly been aimed at the CEOs of the large diversified banks like JP Morgan Chase, and at the investment banks like Goldman Sachs. 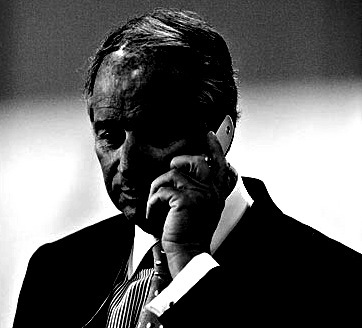 Private equity’s shadowy billions haven’t been subjected to real scrutiny. Mitt Romney’s run for the presidency has changed that, but even here the focus has mostly been on Bain Capital’s record, and Romney’s investments through various Bain funds, with little study of the entire PE industry’s impact on companies, jobs, communities, and markets. There are some economists who have been studying private equity with the critical lens it deserves. Eileen Appelbaum’s work comes to mind. Appelbaum has closely examined the effects that various leveraged buyouts have had on stakeholders in companies targeted by private equity, concluding that PE firms often harm other investors, employees, suppliers, creditors, clients, and communities, in their quest for a lucrative payout. Other researchers have dug deep into the data on private equity’s impact and concluded that there are distortions in the market caused when powerful PE firms team up to take companies private, and that there is strong evidence that the PE industry has become something of a cartel. There’s a lawsuit that builds on these critiques, and which if successful, could change the way private equity operates, subjecting the industry to more regulatory oversight and legal constraint. As of now it’s a relatively obscure antitrust case soon to be argued before a judge in the US District Court, District of Massachusetts. 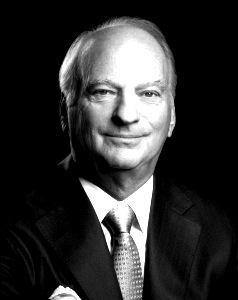 Dahl v. Bain Capital Partners as it’s known, alleges that during the 2000s thirteen of the largest private equity firms orchestrated a massive conspiracy to divvy up the market for the public corporations they bought out and took private. 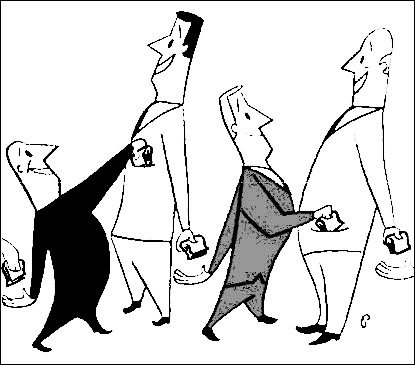 By colluding with one another through an explicit set of rules and understandings —known as “club rules,” or “etiquette,” or simply “professional courtesy”— firms like Bain Capital were able to slice up the market for publicly traded companies amongst themselves, thereby artificially depressing share prices of the companies they bought. That meant, according to the Plaintiffs in Dahl v. Bain, that shareholders in these companies were ripped off, and private equity firms made away with untold millions, maybe billions in profits. The facts currently being argued in Dahl v. Bain almost never saw the light of day. Private equity’s lawyers, a NY Yankees roster of the highest paid partners at the nation’s most powerful white shoe law firms, are seeking to keep as much of the lawsuit under seal as possible. Until last Wednesday they were succeeding, but the New York Times Company managed to intervene in the case with their own motion to unseal the Fifth Amended Complaint and referenced documents. The judge, Edward Harrington, partly granted this motion, and yesterday the Complaint was made public. It’s an interesting document full of references to emails, depositions, and other sources, all of it pretty strong evidence in support of the Plaintiff’s allegations of a widespread cartel-like system within the PE industry to allocate the market for LBOs and suppress competition that would drive up share prices. 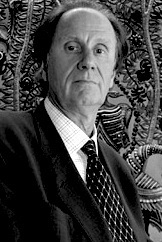 Dahl v. Bain argues that a complicated series of deals took place between 2003 and 2007 (“the Conspiratorial Era”) which when examined together, and along with internal e-mails and documents of the private equity firms, demonstrates a conspiracy to rig the market and drive down prices at which corporate shares were bought, thereby producing huge profits for the private equity partners and cheating other investors. The lawsuit is well researched, and well organized. I figured a couple of illustrations to map the club deals at the center of the case would be useful though. The first map illustrates all of the PE firms that are alleged to have colluded with one another to take various public companies private. It’s a messy map, but there are clearly some PE firms, and some LBO deals that were of more central importance, of greater size, and which linked more firms together with one another. Deals such as TXU, Freescale, SunGard, and Kinder Morgan were big, involving several of the alleged conspirators. Club deals between private equity firms within the “Conspiratorial Era,” Dahl v. Bain. The second map illustrates the core LBO deals and private equity groups in the Dahl v. Bain case, a map produced simply by deleting the pendents (PE firms on the periphery of the conspiracy) of the above network diagram. What jumps out here is that during the so-called “Conspiratorial Era,” a few PE firms played major roles in multiple LBOs. 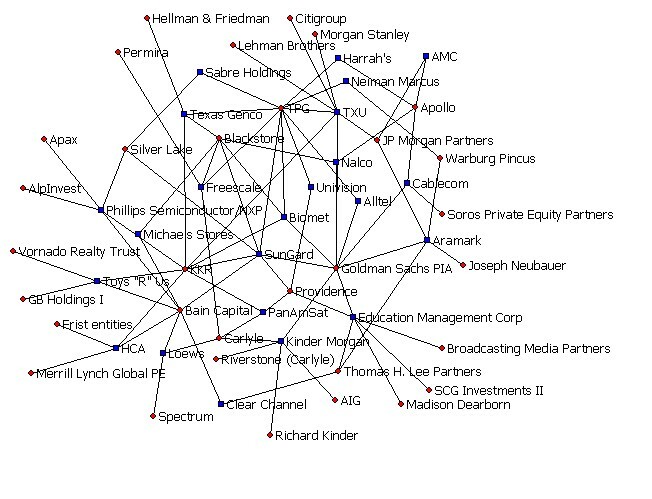 It’s readily apparent from this diagram that TPG, Goldman Sachs PIA, KKR, Blackstone, and Bain Capital played important roles in the alleged conspiracy because they were in on the most club deals. TPG was involved in 10 of the alleged illegal club deals. Goldman Sachs and KKR took their share of nine and eight deals respectively, while Bain and Blackstone took a cut of seven and six deals, respectively. Not surprisingly, these are the first, second, third, fourth, and ninth largest private equity firms ranked by total assets under management. 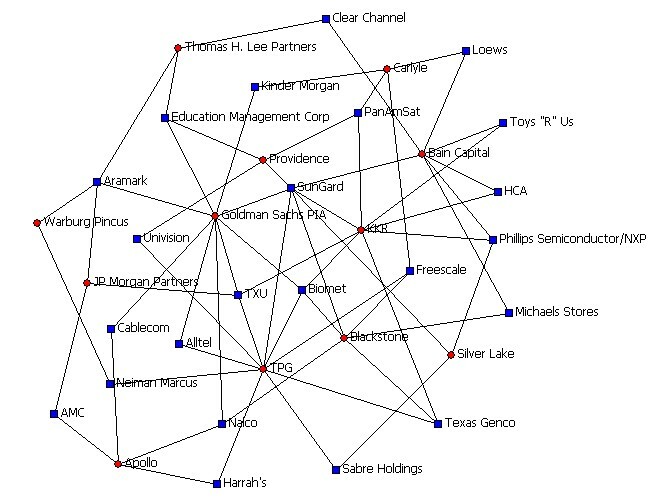 Core network of PE firms and the major LBOs of the “Conspiratorial Era” in Dahl v. Bain Capital Partners.